For years I’ve been wanting to make a plant-based take on palak paneer. The vibrant green color lures me in every time. Thankfully, this recipe is not only simple to make, but also incredibly delicious and requires just 30 minutes! Let me show you how it’s done. This recipe starts with prepping your tofu in curry powder, coconut aminos, and nutritional yeast to mock the paneer or cheese in the classic take on the dish. Next you’ll sauté onion, garlic, ginger, and serrano pepper with cumin seed. Once browned, you’ll add diced tomatoes and cook until tender. While that’s happening, you’ll blanch some spinach and add to a blender with your sautéed vegetables. This creates a creamy base for the palak paneer, which will blend beautifully with your cheesy, crispy tofu! All that’s left to do is heat the mixture briefly on the stovetop with some coconut milk and more spices and you’re good to go! Such a hearty and delicious 30-minute meal! This would make the perfect weeknight meal when you need something nourishing and delicious on the table fast! It’s filling on its own, but also pairs well with cooked grains, vegetable pakoras, easy naan, or mango chutney for the ultimate Indian-inspired meal! Into curries? Also check out our 1-Pot Golden Lentil Curry Soup, 1-Pot Chickpea Cauliflower Yellow Curry, or 1-Pot Pumpkin Yellow Curry. 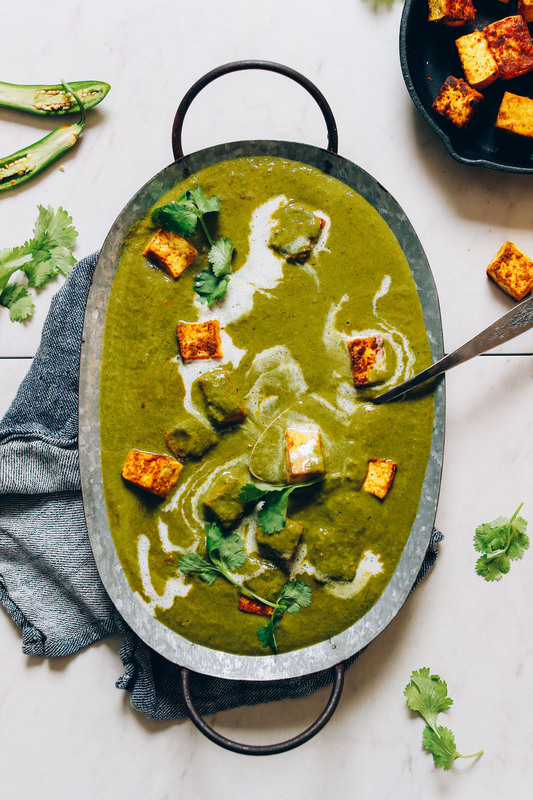 An incredibly flavorful, vegan take on classic palak paneer with curried tofu in place of cheese! 30 minutes required, big flavor, and so delicious! Cube tofu and add to a medium mixing bowl. Season with curry powder, coconut aminos, sea salt, and nutritional yeast. Shake the bowl to gently toss. Set aside. Heat a medium oven-safe seasoned cast iron over medium heat (if using a stainless steel skillet, add a little oil so it doesn’t stick). Once hot, add the tofu and sauté for 3-4 minutes, or until a couple of the sides are browned. Then transfer to the hot oven and bake for 15 minutes. If you prefer firmer tofu, bake longer. If you want softer tofu that mocks paneer, bake less. Set aside to rest in the pan. Fill a large pot halfway full with water and bring to a boil over high heat. While you wait, move on to the next step. Heat a large rimmed skillet over medium heat. Once hot, add oil and cumin seed, ginger, onion, and serrano pepper. Sauté until onion is soft and translucent — about 5 minutes. Add diced tomatoes and garlic and stir to combine. Sauté for 3-4 minutes, or until the tomato has softened. Your water should be boiling now. Add spinach and cook uncovered for 2 minutes. Then strain and rinse with cold water. Drain well. Set aside. Add the tomato mixture to a blender or food processor along with cooked drained spinach and the vegetable broth (or water). Blend into a smooth sauce, scraping down sides as needed. If it has trouble blending, add more vegetable broth or water. Lastly, cook your sauce. Heat the same rimmed skillet from earlier over medium heat. Once hot, add remaining oil (or some water), curry powder, and garam masala. Stir and cook for 30 seconds. Add the spinach sauce and stir. Cook the mixture over medium-low heat for about 3-4 minutes to deepen the flavors. If it bubbles too much, lower heat to a simmer. Then add coconut milk and stir. Taste and adjust flavor as needed, adding salt or coconut aminos to deepen the flavor and curry powder for more rich curry flavor. Serve over your tofu “paneer” and garnish with another drizzle of full fat coconut milk and fresh cilantro. Rice makes a lovely side, as does garlic naan! Store leftovers covered in the refrigerator up to 4-5 days, or in the freezer up to 1 month. Reheat in the microwave or in a rimmed skillet until hot. *Recipe inspiration from Veg Recipes of India. *Nutrition information is a rough estimate calculated with avocado oil and lesser amount of vegetable broth and without optional ingredients. 1. I skipped pan frying the tofu and simply baked it for 15 minutes. 2. I love coconut curries, but I wanted something more authentic tasting, so I made cashew cream (1 c raw cashews, 3/4 c water) and used that instead. It gave it perfect creaminess without adding any flavor. 3. I added about 1.5 cups chopped frozen spinach (thawed first) for texture, and because that is how it always comes served when I have ordered it. 4) Lastly, because I am super lazy, I just dumped the sauce ingredients into the spinach sauce, minus the oil, and stirred. I added salt because it was a bit bland. It is amazing. All of my family loved it, it was totally healthy and I am super excited to be able to eat this all.the.time. now! So glad you enjoyed this, Dee! Thanks for sharing your modifications! I love this, and so does my whole family. It’s super easy and I feel good that the kids are getting their greens. I wonder, though, if you could tell us why we cook the spinach first before blending? Thanks! More vegetarian Indian recipes please!! So glad to hear it, Christine! It is intended to bring out the vibrant color of the spinach. However, other readers have had success with skipping this step. Hope that helps! Nutritional yeast tofu idea was really good. The sauce tasted so GREEN. One serrano was enough for me, I always get a 3 out of 5 on spice scales. Wow this was amazing! Tasted like the real deal! Made this for the first time. It took a little longer than 30 minutes. Had it for left overs and added cauliflower to it as there was plenty of sauce. Also my sauce wasn’t a nice green colour as pictured, but the taste made up for it. On a side note I baked some chicken breasts and added that for my husbands plate. I just finished making this, and got rave reviews. I didn’t really check to see how long it took to make start to finish, but I always assume/know it’s going to take longer than what your recipes say. I didn’t have a serrano pepper so I used 5 small red thai chilis instead, we love spice! Hands down will be making again. The tofu portion is not to be missed, it really adds to it. LOVE! Wonderful recipe – really appreciated the heat in the sauce it tasted completely authentic, esp compared other vegan saag’s I’ve made. It did take longer than 30 minutes and I adjusted the salt + skipped the boiling of the spinach in favour of using less dishes and just cooked it in my already hot for a few minutes. Overall – definitely making again. As always LOVE all your recipes. I love this recipe! The tofu is a revelation, I officially do not miss cheese/paneer now that I have an equally delicious substitute, and my stomach thanks you too. Like some of the other commenters, this took my a lot longer than 30 minutes. I’m all about multi-tasking so I was juggling naan, rice and dessert, and I even cut-out unnecessary steps because I have made palak paneer before, but it still took me nearly an hour. This definitely takes some multitasking, but all the steps are easy. This recipe was so tasty! Thank you for coming up with it! We especially loved the tofu; used coconut cream instead of full fat coconut milk because that’s all we had and the saag gravy still tasted wonderful. It was a tad too spicy for us, (even with us being Indians) haha so I would maybe take out Serrano pepper or something next time for me, but others may love the heat. The only thing I’d not is that it took us about 75 minutes to make this and the recipe says 30 minutes. We have made a few other minimalist baker recipes and it takes us about double the time listed. I think the prep times tend to listed as much lower than they are. This can be frustrating for time management in the evenings when we are looking for something that is actually 30 minute only. I hope this concern can be taking seriously and timings edited on existing recipes and future accordingly if appropriate. Hi Cate, we haven’t tried that, but it might work! If you give it a try, we would love to hear how it goes! 58 minutes from start to finish but holy hell it was worth it!!! Soooooo good. I can’t believe the flavour. I was skeptical because my friend makes a KILLER palak paneer but with paneer and cream. My husband eats a plant-based diet and this is his favourite dish so it was nice I could make this for him and he asked me to marry him again after he tried a bite of this. This recipe was spectacular. This is actually my all time favorite Indian dish. It was simple and it totally delivered. Definitely double the spices. I used the entire can of coconut (just my preference), and the tofu is great (and I’m not a tofu person) and the recipe is simple despite the time it may take you to complete. PLEASE PLEASE PLEASE make a Tikka Tofu Paneer! Wow!!! Best thing We have ever made! So delicious. Whole family loved this!!!!! I did the multi-tasking thing, but chopping tomatoes, ginger and garlic, slicing onions, cutting up the tofu after it’s pressed and preparing it for cooking, measuring out the oil and spices—no way could I have done that in 30 minutes even 40 years ago when I was a spring chick. The results? As another poster commented, the tofu’s fantastic and I’ll use that part of the recipe again for sure. All the rest though, in my book, isn’t worth the time and effort. Made the Vegan Palak Paneer with Curried Tofu this week and loved it (as with all MB recipes!). I try to make recipes that will have leftovers and starting out the spinach didn’t seem to be as much as I hoped so I doubled the amount of spinach. I didn’t feel like I had to adjust anything to accommodate the extra spinach. The dish got tastier and tastier through the week. I will definitely make this again and have already shared the link with multiple friends. This recipe, with it’s easy to find ingredients, is priceless. I just made this and of course accidentally bought reduced fat coconut milk. It’s all good though because this recipe is amazing!!! Full fat would have definitely made this more rich but it was still phenomenal! Much like an earlier reviewer stated I doubled the amount of curry powder and garam masala. This was the best tofu I have ever eaten I was eating the crispy bits off of the tinfoil. This is the only way to make tofu for me now. This recipe bangs and I will be making it to accompany an Indian feast. This is a game changer, and absolutely AMAZING! I made it last night for dinner and my family loved it! 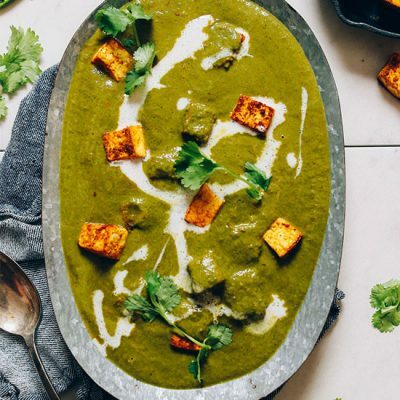 Palak (saag) paneer has always been my favorite south asian dish so I was stoked to see this recipe. It’s soo delicious and I could eat this all the time. The tofu though – wow!! I could snack on that alone. I loved the taste but the texture reminded me so much of paneer. You really nailed it! Definitely making this one again soon. Thank you! I didnt have any tofu so I swapped it for oumph, which also worked fine! Made this tonight and took a cue from others and doubled (in the case of the curry powder tripled) the spices. Yum! As someone who is on a modified LowFODMAP diet, this worked well with the omission of the onion! I’m ok with garlic now, thank goodness. I tossed the spinach into my food processor without blanching it, thus eliminating a pan and turned out great. Used the same pan for sauteeing the tofu for the sauce. Served it over millet, since I’m a weirdo who loves it, but would like to make GF naan next time. Oh, and garnished with some chickpeas for xtra protein! Thanks for this amazing recipe!! OMG – this recipe is AWESOME! The flavours are incredible. I didn’t use a hot pepper because I didn’t have one, but it was still spicy, yet not too much. I did use Mori-No extra firm silken tofu – I often use this one for “paneer” because I find the soft texture is similar to what I remember with paneer. Because the tofu is quite soft, I skipped the pan-frying and just put cubes into a bowl, seasoned as directed, and roasted in the oven. WOW! This recipe just made my Favourites list. Super simple. This was great! I agree with the others who’ve said it’s a good idea to double the spices. I made it as written and have ended up adding a lot of hot sauce to each serving. I also wish it didn’t use so many pans! Ah, we love Ethiopian food! Any specific dishes to request? Ooh I mean the lentils (misir wat?) are a solid favorite but I will say that I had some stewed beets at an Ethiopian restaurant once and it blew my mind. A GF injera recipe would be fun too – I know traditional injera is 100% teff flour and therefore naturally gluten free! Just catching up on reviewing all the recipes I’ve tried lately. This was delicious, as expected. Great flavor and I loved the tofu. So easy to make, too. Thank you! This recipe is AMAZING. I followed it exactly, doubled, and served over quinoa. I always obsessively read comments but never leave them myself, this recipe changed that! Thank you for another amazing recipe! Delicious! I have tried many times to make palak paneer at home trying to find the most authentic (and often overly complicated) recipe, and have always been disappointed. This one did not disappoint! Very close to a restaurant version. Easy and fast, too. I skipped the sauté step with the tofu and just baked it to save on dishes and thought it turned out great that way. Made it last night and had it for lunch today with rice – wonderful! So delicious, full of flavour and creamy! It tasted rather strong yesterday, but i guess it settled and balanced out overnight. The only change i made was to substitute tofu with a new exciting something-like-tofu product we have here in Finland – Oat Block. It’s made of oats and pea protein, has a very mild pleasant taste and a texture similar to paneer. I just cubed it and added to the sauce without any frying. It worked really well! Thank you for this wonderful recipe! Thanks for sharing, Laana! That Oat Block sounds incredible! Hope it lands in the states! The sauce being grey doesn’t look very appetizing, although I’m sure it’s delicious. I bet it’s the curry powder that turns it that color? I’ve had a palak tofu recipe for years and it’s good green color. For my recipe instead of blanching spinach you wilt it in a hot oiled pan, way quicker and brings out color just as well. The curry powder can turn it a darker color, as can soy sauce / coconut aminos. You can also shorten the cook time at the end and only bring the sauce up to just hot instead of cooking longer. The spinach turns darker the longer it’s cooked! A big giant THANK YOU!! This recipe, although quite a bit a work without pre-prepping, was worth every minute. I made it pretty close to your recipe, on jasmine rice. Mixed the blend of regular and hot curry. You were on the money to use the amino’s in the end to bring out the curry taste. You are amazing! This recipe is a winner!! My husband and I enjoyed it so much the first time around that I made it again less than a week later. Nothing but positive reviews here!! The only thing I will say is that the prep time is definitely much longer than what the recipe specifies. I think the only folks that could get it done in 30 minutes are those more experienced at cooking. I am not a novice by any means, but I found the prep to be rather long. However, it is well worth the effort. The flavors of this dish will leave you wanting more! I doubled the recipe the second time so we could have more leftovers. I’ll be making it for company next weekend. 5 stars!! This turned out to be a “restaurant quality” dish. It really doesn’t take that much time after you study the recipe. Next time I’ll use two blocks of tofu for four people. I increased the “marinade” by 50% so that the cubes would be well seasoned. Used tamari rather than coconut aminos. Biggest change was that I used an immersion blender rather than a food processor or blender. Removed the pot with the vegetables and spinach and put on a hot plate. By tilting the pot a bit could submerge the stick blender. So much easier in that could do it in the pot and also not have to clean up an appliance. What is termed a “sauce” is maybe a bit misleading as it’s more like and Indian “tarka.” I put those ingredients in a small saucepan and then added to the mixture. Stirred in the coconut milk before letting all of it simmer. Thanks for sharing this fantastic recipe. I meant a trivet and not a hot plate. Lovely! Thanks for sharing, Stephen! Incredibly delicious and relatively easy! I always shy away from making Indian dishes because they feel so complex but this seemed easy enough, and it was! There is a bit of multi-tasking involved, but I had help from my boyfriend so the multi-tasking wasn’t too challenging. I’d recommend getting all of your ingredients measured and set out ahead of time. The tofu was also insanely good. I had some tofu leftover and ate a few pieces on their own as a snack the next day and they were so tasty and satisfying. Thanks so much for this recipe!! It will be a new staple in my kitchen! This is truly masterful — and I say that as someone who grew up eating palak paneer. :) Brilliant recipe. The thing I love most about your creations is that I have NEVER messed anything up, which, trust me, is rare, lol! Everything I recreate on your blog turns out beautifully, so much so that I’ve tricked people into thinking I actually know my way around a kitchen. When I tell them about your site, they quickly become fans. Thank you for sharing your creativity with the world. Once again an amazing meal! Every recipe I’ve made is a 10/10. Being vegan and gluten free you are constantly my life saver. Absolutely wonderful, delicious dish. It makes a lot of sauce so I made a second batch of the seasoned tofu the next day for the leftover sauce. Minor adaptations based on items in my pantry included using fire roasted tomatoes (Muir Glen brand) and one tsp canned green chilies vice the Serrano pepper. As Dana mentioned I used cumin powder instead of going out and buying cumin seed. I ate this dish three days straight it was so good. 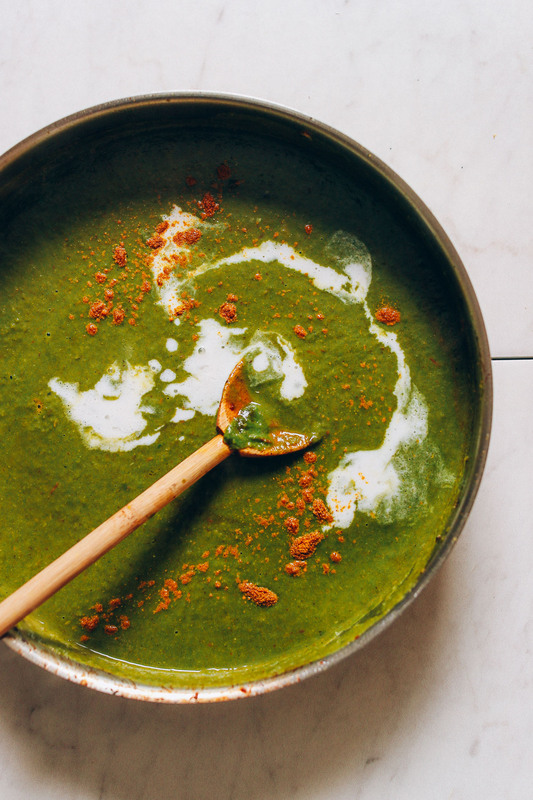 May bring it to a potluck next week for St Patrick’s Day—it’s the color green after all! PS: To press the tofu I wrapped it in paper towels and laid a full unopened vegetable broth carton sideways on it. Left it alone 15 minutes. Then opened and used the same carton later when adding the broth to my blender. We made this recipe last night for dinner, what a winning combination! Lately I’d been feeling a little stagnant with my plant-based recipe inspiration but this creation has reignited the flame! I baked the tofu cubes for 20 minutes total (max crispiness!) and added additional curry spice to the final blended sauce. Make this dish, you won’t be disappointed! Loved this dish! Soo delicious and satisfied the saag paneer craving for sure. Wish Indian food restaurants in my neighborhood served creamy vegan options like this. Next time I’ll increase the spices a bit to get a tiny bit more flavor but truthfully it was a near — if not already — perfect recipe in my book! I made this today for lunch. Although it was a lot of work, the end result was very tasty. The only thing I would change is to maybe double the amount of spices called for. I found that the taste was a bit mild for my liking but otherwise it was quite authentic. My house even smells like a restaurant! Silken tofu will usually not hold its form – it’s quite soft. I’d recommend firm or extra firm if you can! hey! I am interested in trying this but I wanted to make some corrections. Palak Paneer is traditionally a north indian (Punjab) dish. South India also has their take on it and looking at this recipe and ingredients used, this take on it is more the South indian version (e.g: addition of coconut oil/milk – north indian cooking does not incorporate this but the south does as coconuts are abundant). Also, using regular spinach vs. baby spinach will make a taste difference. Regular spinach (organic if possible) has an earthier flavour than baby spinach so that will give a more authentic flavour. And, if time permits, cooking the spinach with the spices on low heat for a few hours really brings out the flavour (in lieu of blanching and food processing). Just check it every so often and add more water so that it does not stick. Green/Red chilies (the long skinny ones) are the ones to use to give it some heat. Hope that helps! So good! Will definitely be making again soon! This was amazing! So so delicious, will definitely be making this regularly. So delicious! Tastes restaurant quality. Thank you so much! Yay!! So glad you enjoyed it, Sophie! 4.8 stars. Made this tonight and loved it. Shared the meal with my adult son, who licked his plate clean but also shared that he’s not so much into tofu these days. He suggested substituting the tofu with oven roasted potatoes. I’ll try that next time! Lovely! Thanks for sharing, Peggy! Yum yum, I made a saag tofu several years ago, but I have yet to make a rendition on it. Means that I can test out other recipes like this one, which looks absolutely magnificent! I am loving this vegan take on the recipe! Thank You! Delicious! ***** 5 extra stars! Oh yum yum. 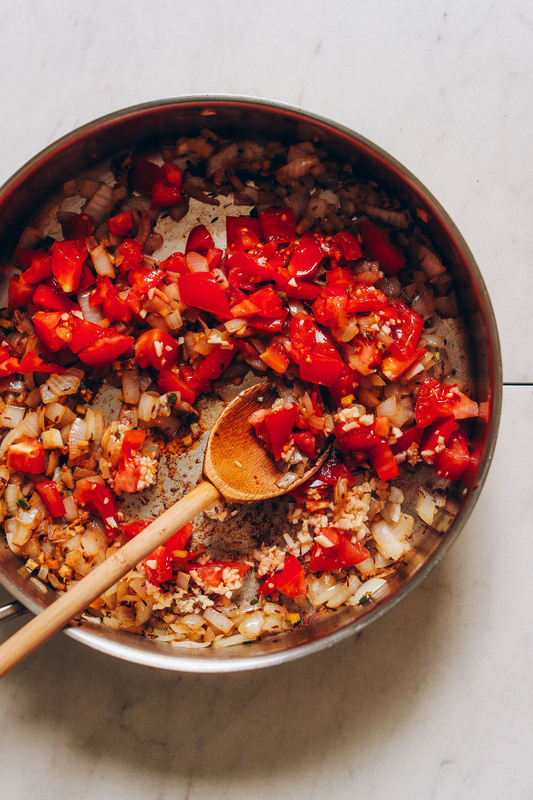 I just made this for dinner and served it over brown rice – thanks for the recipe! My curried tofu was a little salty for my taste – is this because I used tamari instead of coconut aminos? I didn’t add the additional salt called for. Hi Hillary, yes, that is most likely why! We would recommend using less tamari than coconut aminos. Hope that helps! Thank you Dana! How much less, do you suppose? I just made this and it was delicious! Just the right amount of spice, if you don’t mind a little kick ;). It’s very saucy and I think if you did two packages of tofu you would still have enough and then some. I served this with basmati rice but I think I might try the naan next time as this dish is begging to be sopped up. Thank you! Whoa whoa! Thanks for sharing, Genevieve!! I was going to make this for dinner tonight and thought I’d prep the tofu yesterday when I had some spare time…but we ended up eating all of the curried tofu! It was so delicious that I will have to make some more to cook with the gorgeous green sauce since palak paneer is usually the dish I test out at various Indian restaurants to see how great they are. Yay! Thanks Tracey!! When you do make the whole dish, would you mind leaving a rating with your review? It’s super helpful for us and other readers. Thanks! Woops! I didn’t see the stars the first time, I was just so excited to share how yummy the curried tofu was. Just made this and it’s sooo good! Instead of blanching the spinach I just tossed raw greens in the saute pan with the veggies and wilted it, then blended. Reminds me of the palak paneer from my local Indian restaurant that I miss so much! Whoop! Thanks for sharing your spinach preparation. Love it! I subbed baby kale for spinach and tempeh for tofu. Didn’t bake the tempeh just steamed then sauteed with the spices, aminos and nutritional yeast) and it turned out AMAZING!! Yay! Thanks, Suzanne! Next time would you mind leaving a rating with your review? It’s super helpful for us and other readers. Thanks! Wow, what a flavorful, delicious dish that didn’t take long to make!! Tastes like restaurant made. I couldn’t stop eating the tofu “paneer”, so my leftover lunch tomorrow wont have as much :*( haha. I didn’t have spinach, so I made a tomato curry using basically all the other ingredients listed and ate with rice. A++ Dana! Palak Paneer has always been one of my favorite dishes! After figuring out my dairy allergy, I sadly have to give this up…. UNTIL NOW!!!! 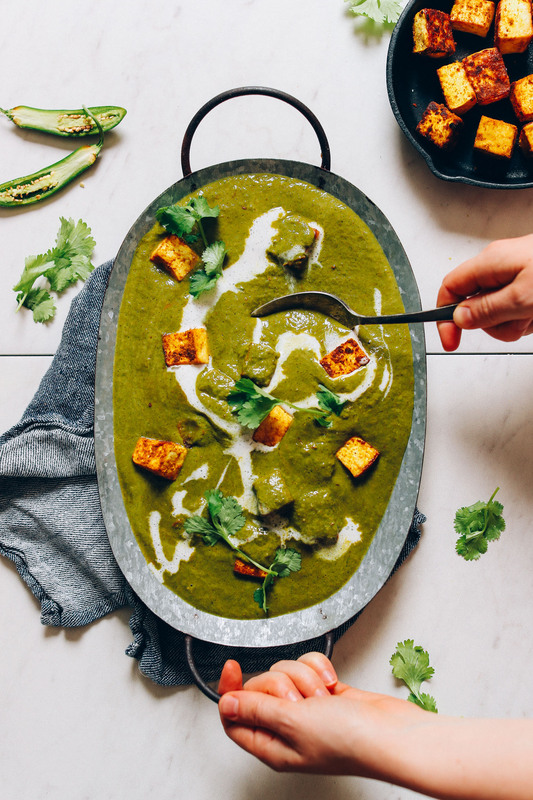 Dana, this is literally the best Palak Paneer I have ever had and I have eaten this at a ton of places including very traditional Indian restaurants. I took a bit of this while I was making it and literally said, “holy sh*t!”. 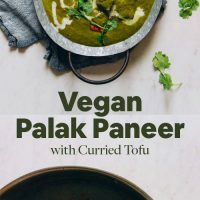 If I wanted to use paneer in this recipe instead of tofu would I still cook it the same? We aren’t sure, but we think the paneer would be added at the end and not be cooked. Hope that helps! Fry the paneer in a little oil until it spits and is brown ish red on the outside. Set aside on paper towels and add at the end. No baking! My husband made this for our family the day you posted it. It was so so so so good! We especially loved the curried and crispy tofu. The flavors were all there and it tasted rich and creamy. We ate it with chapati and some channa masala. Thank you for this recipe!! I wish I could give this more stars. It was hands-down the best palak paneer I have ever had. Thank you for this amazing recipe. I can’t wait to make it again. Ah! Thanks, Melanie! Such a kind compliment. So glad you loved it. I just made this, was so happy to see it appear on your blog it is one of my all time indian favorites! Yay! Thanks Zoe! Next time would you mind leaving a rating with your review? It’s super helpful for us and other readers. Thanks! I have just finished making up the sauce and it is AMAZING! 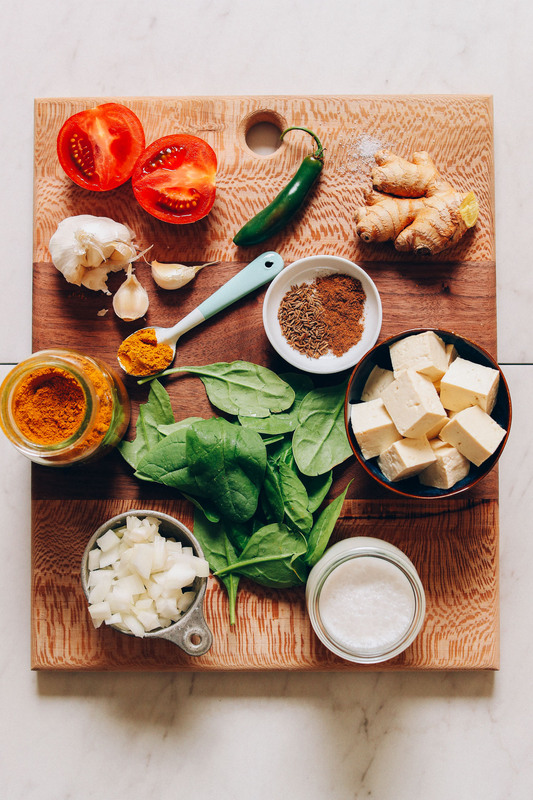 I made one switch up based on some other paneer recipes I reviewed – I used the solid coconut milk to cook the spices in, then added the spinach mixture. I used the spices as written as it is perfect! Great that the sauce can be made ahead of time and then the tofu can be prepared just before serving. It’s marinating with the spices. One of likes soft tofu so that will go in the sauce and the other can have the oven baked. This is amazing…I can’t wait for dinner! thank you. Lovely! Thanks for sharing, Nancy! What a delicious recipe! Made it last night and loved it so much I had leftovers for breakfast with an egg on top. The sauce is perfect! Thank you for making vegan, gluten-free and vegetarian cooking exciting! It was delicious. My company loved it. Well done! Delicious ! This was a favourite dish before I went vegan. Love this version – creamy, full of flavour and the tofu is on point. Next time I might pump up the spices a bit more, but will definitely make again! OMG, this dish is so delicious and fresh tasting. Works so well with the tofu and so easy to make. So glad to hear you enjoyed it, Clara! Thanks for the lovely review! I made this today and it is so delicious! I’m honestly surprised at just how good it is! I will definitely make this again. This looks so amazing but I dont have coconut aminos, is there anything I can substitute this with? Thanks! We just made this dish for our Sunday lunch and it rocks! The taste is rich and the dish is very filling and lovely. Just like from the restaurant. The recipe is easy to follow and it turned perfect. Thank you, Dana, this was a blast. Yay!! This looks so good and I can’t wait to try the tempeh bolognese! Are you going back to your old more frequent recipe posting schedule? Ha! Yes. We slowed things down a little recently, but are going to be posting more frequently moving forward. xo! The tempeh bolognese is so good, just made it last week. Made this just now and it was delicious! I used 2 packages of extra-firm tofu for 3 hungry adults and a toddler who eats like a teen. I served it with basmati rice and there were next to no left-overs. I made modifications, only to the amount of seasonings (I don’t measure but I more than tripled my curry powder, garam masala, nutritional yeast, ginger, cumin seeds, and garlic. Hubby and I always up the seasonings on Indian food at home as we find that it’s hard to over-season Indian food but very easy to under-season. If I had more time I would have let the seasonings soak into the tofu for an hour or more, so this could be great to prep and place in the fridge in the morning for an evening meal. This was very flavorful and tastes very close to restaurant quality but don’t skimp on the spices. Next time, I’ll bake this for about 20-25 minutes because we like our tofu to be a little more on the firm side. Great recipe overall! I have been waiting forever for a vegan palak paneer. This is probably the only dish I miss since becoming vegan. I cannot wait to try it out. One question, can you substitute anything else for the coconut aminos in the tofu? Perhaps Braggs liquid aminos? Thank you! I used Braggs and it was delicious. Thanks for sharing, Holly! I agree – I think Braggs or tamari would be great substitutes. Just start lower and work your way up as coconut aminos can often be less salty in my experience. Can’t wait to make this! My market didn’t have nutritional yeast on hand. Should I skip it or is there a sub you would suggest? Thanks! I think you can skip it. I don’t like the flavor of it so I never use it. Its job is to make the flavor a bit “cheesey” but without it the flavor will still be good. Vegimite is also a replacment for nutritional yeast. I’d say it’s not necessary. It does add a “cheesy” paneer-like flavor. But you could also just try a little garlic powder instead. Hope that helps! Indian food is our favorite and I love tofu as a sub for paneer. Drooling already! I’m beyond thrilled to find this recipe today. Was going through my vegan cookbooks in search of a good paneer recipe. Question: How long should the tofu be pressed? It doesn’t need long – I usually press it first thing and press for 5- 10 minutes while prepping the other ingredients! This looks fantastic. 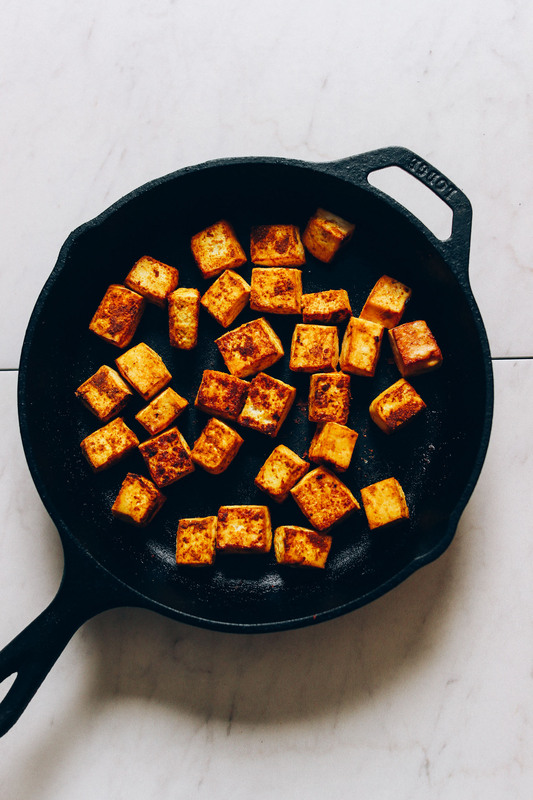 I never got a chance to try paneer before I went vegan so I’m super excited to make this! Could you just blend up the raw spinach? Why do you need to cook it first? Hi Elaine, that could potentially work! 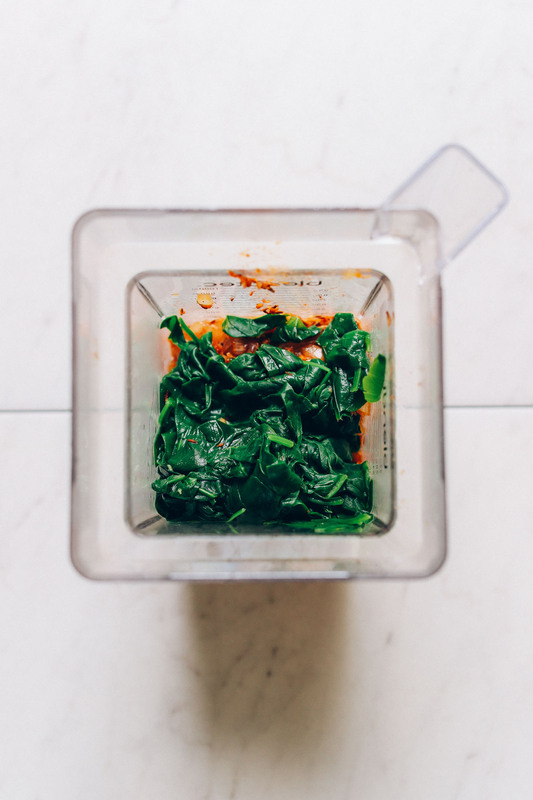 We haven’t tried it as this method is intended to bring out the vibrant color of the spinach. However, let us know if you do try it! water. So after I poured the tomato mixture into the blender, I put the water into the empty skillet, brought it to a simmer, added the spinach and covered it for a minute. It wilted it without overcooking. Added the spinach and liquid to the blender. Worked well. Glad to hear it worked out! Thanks for letting us know! hello Dana! thanku for sharing VEGAN PALAK PANEER WITH CURRIED TOFU racipe. this is a new racipe for me. i will try this racipe definatilly for different test. thanku so much dana. This was delicious- I haven’t had paneer in 2 years since I went vegan – I think it tastes really similar- well done!